The average civilian with no time in uniform cannot be approved for a VA home loan because this mortgage is a benefit offered in exchange for military service. FHA mortgages, on the other hand, are open to all financially qualified borrowers. December 2, 2018 - If you search online to compare features of VA home loans and FHA mortgages, you will likely run across articles stating that VA loans are up in recent times and encouraging borrowers to investigate their VA mortgage loan and mortgage loan refinancing options. Some articles urge borrowers to look into VA home loans because of their advantages that other loans do not offer such as no private mortgage insurance requirement, no down payment, and the ability to refinance with a Streamline loan later with no VA-required credit check. What these articles often do not tell you is that VA mortgages, unlike their FHA loan counterparts, require the applicant to qualify with military service. The time-in-service requirement may vary depending on how long ago the service member signed up. The average civilian with no time in uniform cannot be approved for a VA home loan because this kind of mortgage is a benefit offered in exchange for military service. FHA mortgages, on the other hand, are open to all financially qualified borrowers. And while FHA mortgages for new purchase loans will always require a down payment, borrowers are free to seek down payment assistance from local agencies as long as that down payment help meets FHA requirements. FHA borrowers are also free to get down payment help from friends, family, and employers through gift funds that are sourced according to FHA home loan rules. The basic features of an FHA mortgage are similar to VA loans in that there is an appraisal required, a credit check with more forgiving requirements for FICO scores due to the government’s backing of the mortgage. FHA loans, like their VA counterparts, also have an Energy Efficient Mortgage option that lets you add funds to the loan for approved upgrades, and a Streamline Refinance loan option that has no FHA required credit check in most cases. Do you need expert advice about FHA loans and how they compare to their VA or even USDA or conventional counterparts? You can discuss your needs with a participating FHA loan officer regardless of your eligibility for other mortgages. If you are a military member, FHA loans are open to you, too-even though you have the VA loan benefit. Some house hunters may have already used VA entitlement on a home loan in the past and wish to explore other options, or they may choose to save their VA loan options for another day for a variety of reasons. 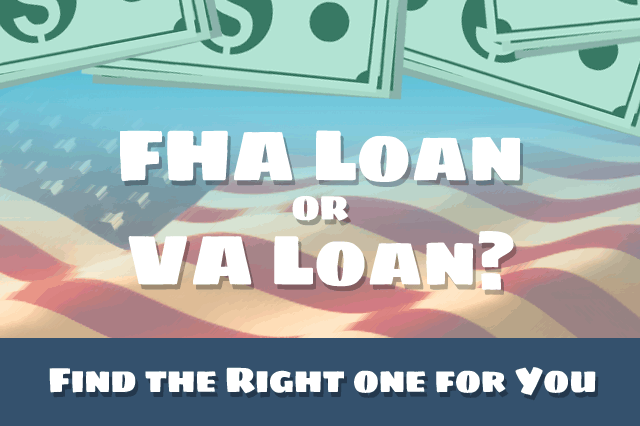 The bottom line is that whether you have access to VA loans or not, whether you are a first-time home buyer or not, the FHA home loan option is open to you assuming you are financially qualified to be approved for the home loan.